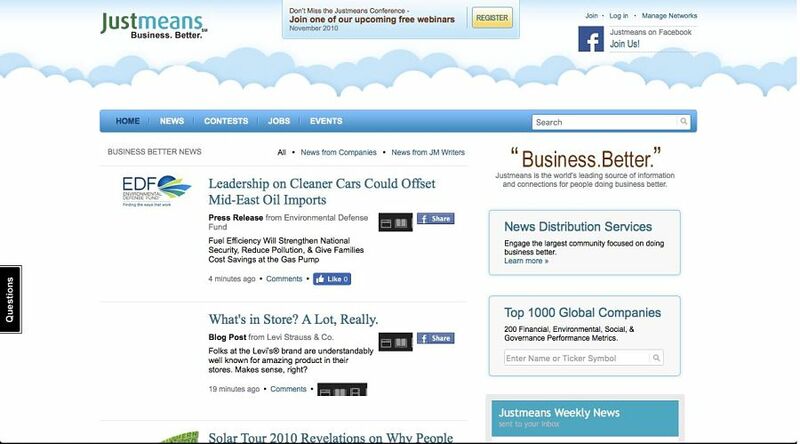 2009-2011: I was a member of the editor team for Justmeans.com. 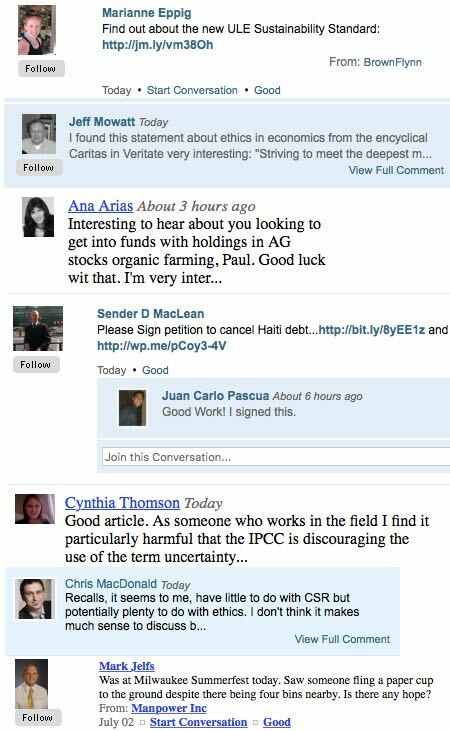 Justmeans.com at the time was a startup media company that promoted CSR Corporate Sustainable Responsibility. Its main audience was and still is CSR managers at major corporations. A few major companies included Campbell Soup, Timberland, Coca-Cola, Intel, and the World Wildlife Federation. Justmeans provided information, market research, and a community to allow companies to engage and promote sustainable ideas that increased the triple bottom line: people, planet, and profit. Justmeans.com was acquired in 2011 by 3BL Media. The audience was college educated, corporate managers of sustainability and renewable energy strategy and public relations, as well as consumers of green living. Audience: College educated, corporate managers of sustainability and renewable energy strategy and public relations, as well as consumers of green living. 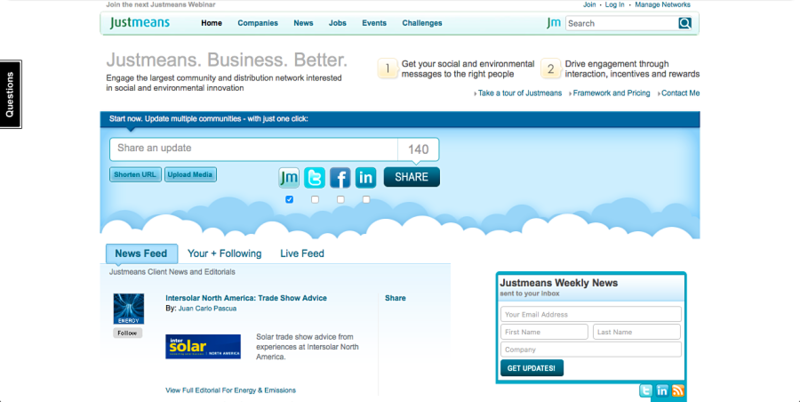 Justmeans.com is an online community and publisher of news about corporate social responsibility, sustainability, energy, health, education, technology and innovation. We are a one-stop information source for business professionals, executives, journalists, bloggers, academics and news organizations who are engaged with and interested in our subject areas. Justmeans editorial, blogs and videos are researched, produced and edited by journalism professionals and serve as an authoritative source of news. 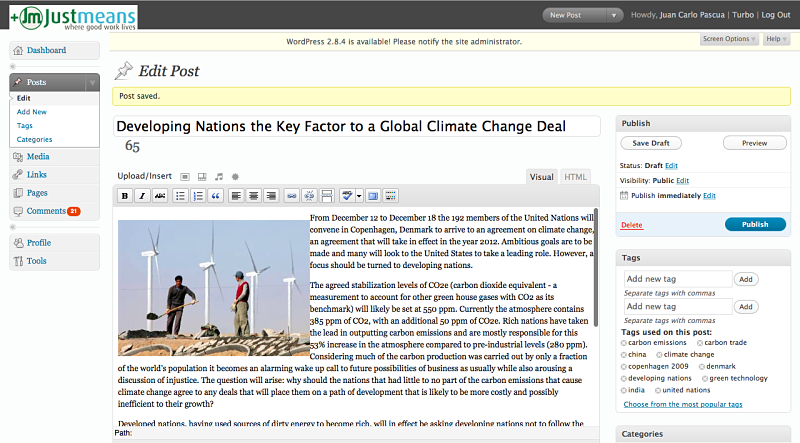 Access to all levels of Justmeans’ content is free of charge. Justmeans had over 250,000 followers. Each post was purposely several hundred words in length, no more and no less, to allow for readers to consume content within a few minutes. A combination of word length, strategic key word placement, and key word frequency were used to exploit algorithms of the popular search engine, Google Search. Linking content with previous works was also important to this SEO strategy. If I was to write a piece about solar energy and I referred other renewable technologies such as wind energy or geothermal, I would make sure that those key words “wind energy” or “geothermal” were hyperlinked to my own blog posts regarding “wind energy” or “geothermal,” respectively. This ensured that the reader was provided with as much information as possible and as many opportunities as possible to consume and engage with my content. Prior to joining the online editorial team, the main content for this startup was characterized by typical blogging in the first person. Much of the content was opinion pieces regarding personal views and anecdotes. When I joined the team I brought a unique style of writing that was characterized by a more objective view of current events and hard facts. I also would provide citations of content and academic research using American Psychological Association (APA) style citations to increase the legitimacy of the facts that I wrote about. Occasionally, I would write more creative pieces that related the issues of energy, environment and climate change with popular culture to allow readers a variety of posts. Because of the successful popularity of my writing style, the management team would request all other writers to follow my lead. Since then, the entire strategy of Justmeans has turned into a objective online news network. 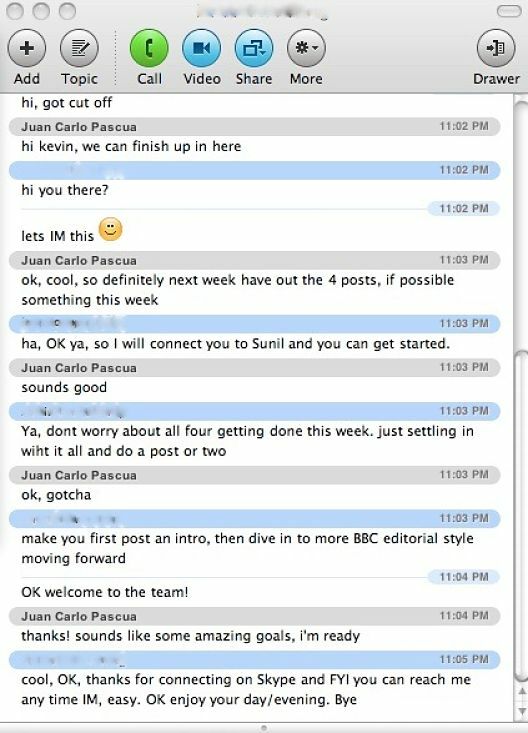 Late night discussion of the content strategy with a Co-Founder of Justmeans. It was imperative that the team communicate regularly. 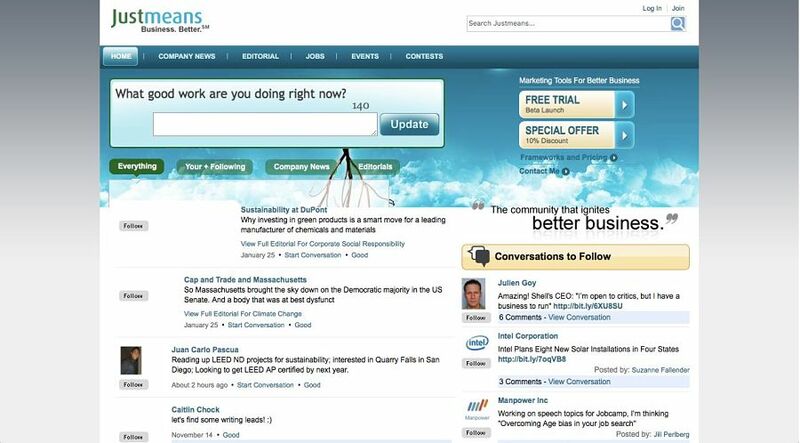 The Content Management System (CMS) of Justmeans was developed with a WordPress backend. Over my 18 months writing regularly for Justmeans, I was able to fully master the WordPress platform and would later launch several WordPress based websites. My most latest projects are: Prestartable.com as well as ResRover.com. Additionally, I utilized professional and academic tools such as Skim PDF Reader. 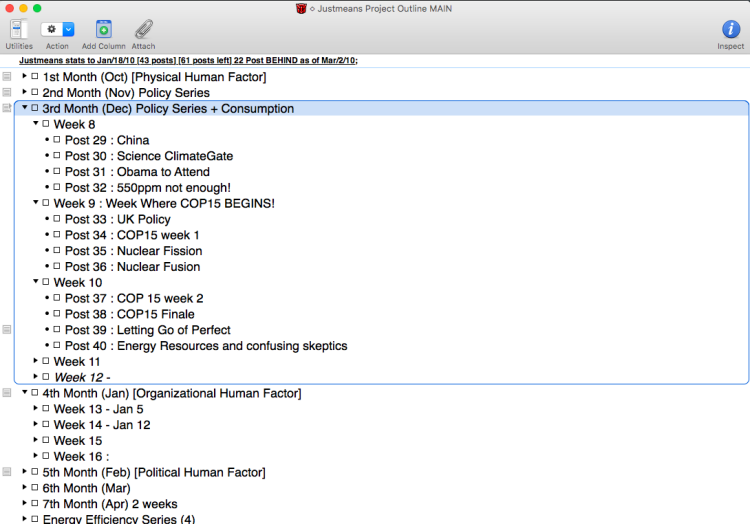 Skim allowed me to more efficiently analyze my source material and organize my thoughts. I used the professional database software, DevonThink Pro Office, to organize the articles that I read so that as my database grew my expertise grew and this would assist in creating better informed writing. I read over 150 articles and books to support my work. I used OmniOutliner to organize my post schedule and strategize a concerted effort to educate readers. Each month I had a certain theme, for example month one was to go over the Human Factors of Climate Change and months two and three were about Climate Change Policy. Seven months of posts were scheduled well in advance of their posting date using OmniOutliner. Professional database Devonthink Pro Office was used to organize research, facts, notes, and final drafts. Last night my I went to a friend’s house for a casual game of poker. I’m not much of a cards player but the ‘guys night’ appeal didn’t sound so bad—just telling jokes and having a few beers with buddies is typically a good time. We played Texas no limit hold’em. Its pretty much straightforward poker but with some shared cards and no limit on betting, which means that anyone can raise of stakes of a hand very quickly. I’m quite risk-averse and conservative, which inevitably makes me a bad poker player. Rather than going ‘all in’ (betting everything that I have on just one hand), I tend to bet in small increments and fold whenever the stakes get too high. As I pursued my conservative strategy throughout the night, I slowly but surely realized the problem with it. I won and lost small increments of money, which kept my bank pretty much where it was from the start. But as other people lost all of their money or made huge amounts of money, having what I started with wasn’t so impressive. I mean, I was still in the game hours after we began, but the others that remained had huge amounts of money. Their ability to out-bid me and scare me off of perfectly good bets meant that I would inevitably lose. I didn’t really realize this until the very end, when I became hopelessly overpowered and eventually (many hours later) lost. Thinking back on it, my strategy was pretty bad. I spent hours working on incremental gains but as a result inevitably lost. I could have won perhaps if I had gone ‘all in’ on a few hands from the start but I was too conservative to do it. If I had lost those early hands, I could have retired to the sofa with the others. If I had won I could have walked away with some money. But my approach doomed me to a long and losing poker night. If you are, for some reason, keenly interested in what I did last night, then this post is done. But if you’re interested in climate change, then stay with me as I explain how my poker match ties in. What I realized this morning is that my approach to climate change and sustainability, and probably many others’, resembles my strategy in poker a lot. I buy green here an there, I do my part when I can, I change my thermostat a few degrees, and I try not to fly as much. I adopt an risk-averse and conservative approach. Energy is synonymous with wealth. The more energy a country uses, the wealthier a country has to be. More energy use means more carbon emissions (leading to global warming), but it also means more economic growth: food, goods, and jobs. Few countries stand to grow in the next few decades as much as India. Energy is tied to growth. Ten years ago 1 billion Indians lacked access to electricity, now it is closer to 400 million. India’s energy consumption is growing. A fight for more energy use is a fight against poverty; energy increases will produce more food, transport more kids to schools, transport more people to work, and transport more food to markets. Yet, as of 2003, India’s power usage was 70% from coal- the greatest polluting fuel we have to burn. Energy in India is inherently tied to coal. Asking India not to delve into their vast coal supply is asking India not to fight poverty. As of January 4, 2009 there remained 267 billion tons of coal within India’s borders. That resource could power 78 billion US households in one year. However, India cannot go blindly following the path of developed countries. It has a unique opportunity for sustainable growth that isn’t curtailed by an out of date infrastructure- a roadblock to other nations trying convert to renewable energy…. At the core of my writing process was research. I did more to cultivate a good pipeline of interesting facts and figures from credible sources. I thoroughly understood the subject matter. Then I would write and rewrite. My process is basically making sure that the blogs are data driven. At the same time I made sure the writing had enough key words. 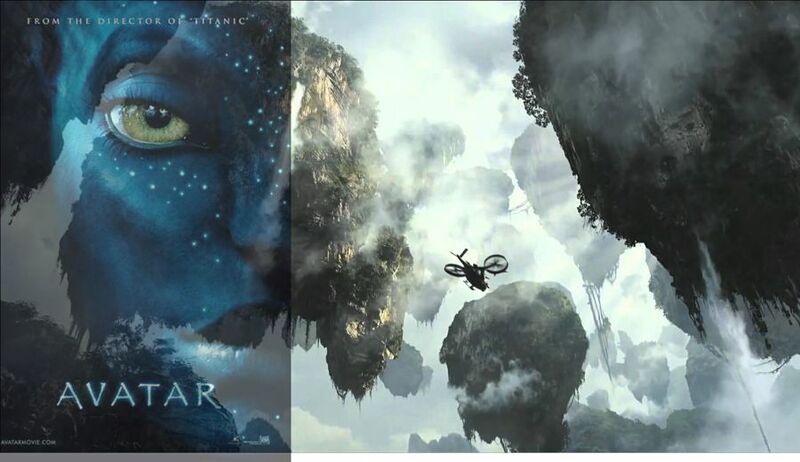 If you went to the google search bar and typed in “Climate change and avatar” you would see the first search result was the one I wrote for SEO optimization. 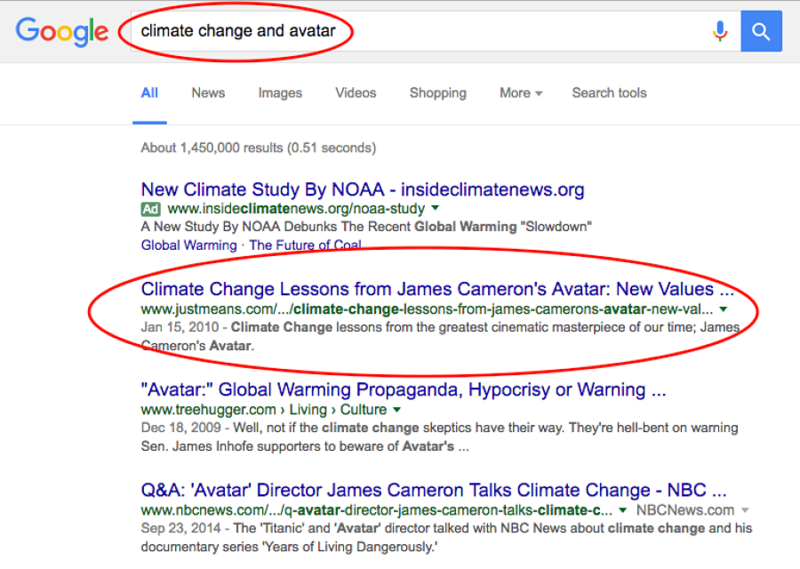 My SEO optimized post for keywords “Climate Change” and “Avatar” appears first on Google Search. This was the moment I understood the power of SEO writing. I was one of the most popular writers. The average writer was able to garner 200 or so views per blog post, but I was able to gather 500 up to 2,500 views per blog post. In total, I wrote over 113 blog posts, which included the external blog. My editor profile can be found here. The external blog that feeds to Justmeans can be found here. My experience working with Justmeans.com, the editorial staff and co-founders was immensely influential in my career. Being able to read and research renewable energy, sustainability, environment, and climate change issues provided me with lasting knowledge of the subject matter. I was given an opportunity to hone my writing to be concise and directed at a specific audience and submit high quality work at a high pace. 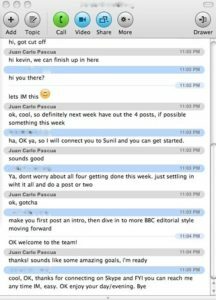 I had an insider view of the SEO strategy of an online media startup company that managed to successfully exit and get bought. I consider my time with Justmeans.com one of the most influential times of my career and an experience I am grateful for.